The expression on Achza's eyes is what inspired me to make this mosaic. This is a progression from "Achza Silhouette" which has a more neutral expression. Getting the focus of the intense stare was important me. The abstract shape created by her darkness against a bright background and blanket gives the composition the kind of graphic quality I always find appealing. 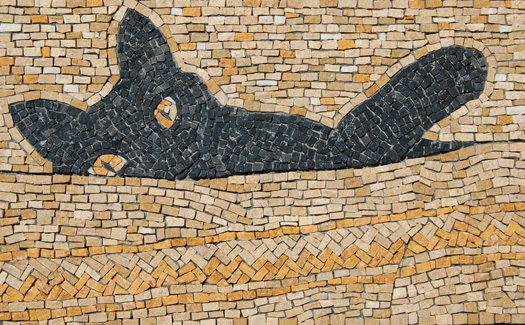 The marble used came from small tumbled 5/8 inch floor tiles cut down into squares for the cat in a classic style. The rectangular shape of the pieces for the background gives the whole a more modern flair.